This is a dish that I created by improvising a salad that my daughter’s grandmother would serve me when I visited Lebanon many years ago. I do not speak more than a few words of Arabic, but back then I referred to this dish as “Salata Taibeh” (tasty salad). My Arabic grammar wasn’t perfect but she always knew what I meant and it was always delicious. I have found that produce in Lebanon and in smaller countries in general (including European countries I have visited) to be so much more delicious than they are in the United States. I mean a tomato actually tastes like a tomato over there. I think that is because their vegetables are grown locally in a green house. 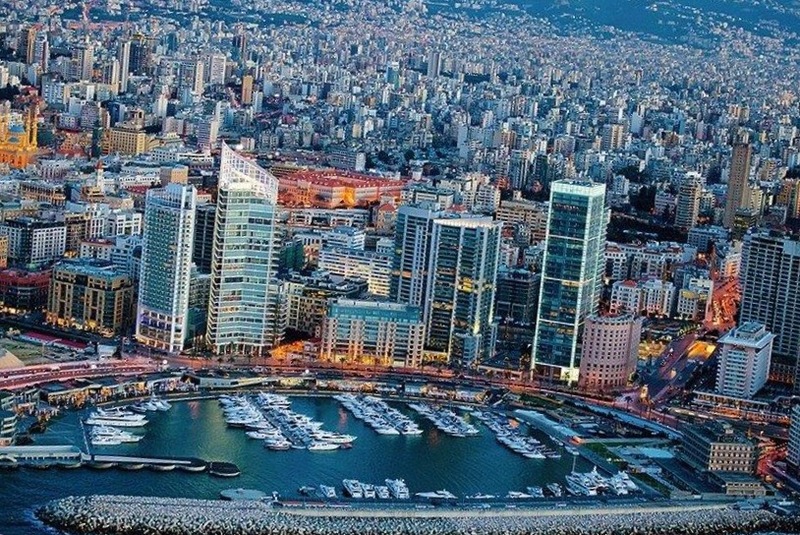 A few years ago I was having breakfast outside on my balcony of the Four Seasons hotel in Beirut, overlooking the Mediterranean Sea, and what did I enjoy the most? A freaking radish! I was at the Four Seasons for goodness sake! Everything was delicious…but it was the radish that really spoke to me! But, I digress. Even with our mass produced tomatoes, this salad is tasty indeed with the tart lemon and the bite from the garlic, balanced by the earthiness of the olive oil. But, if you can buy the tomatoes and cucumbers from a local farm or farmers market, you may be amazed at how much better they will taste. 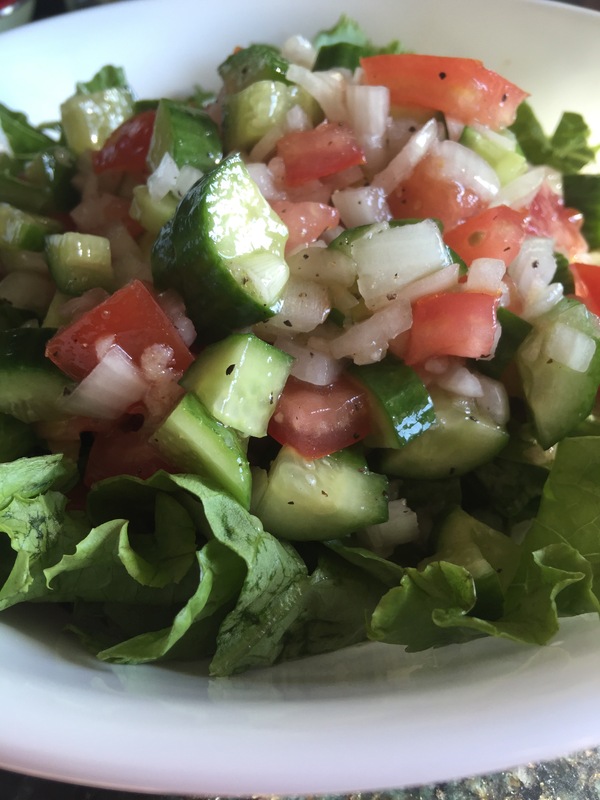 I have added green leaf lettuce to my Americanized version of this tasty salad and I did not include the mint that is traditionally used (or radishes for that matter), but it is pretty close to the “Salata Taibeh” that I still fondly recall today. I hope you enjoy it as much as I do. Salad spinner (this is the exact salad spinner that I have used for years and I highly recommend it. It is big enough for a serving a large family and it has served me well for at least five years now). But any salad spinner that meets your serving needs should do. Vegetable cutting board (to avoid cross contamination, it is wise to dedicate different cutting boards to vegetables and others to raw meats). I use this kind so that I can keep them straight as to which is which. The green stripe on the side means veggies. 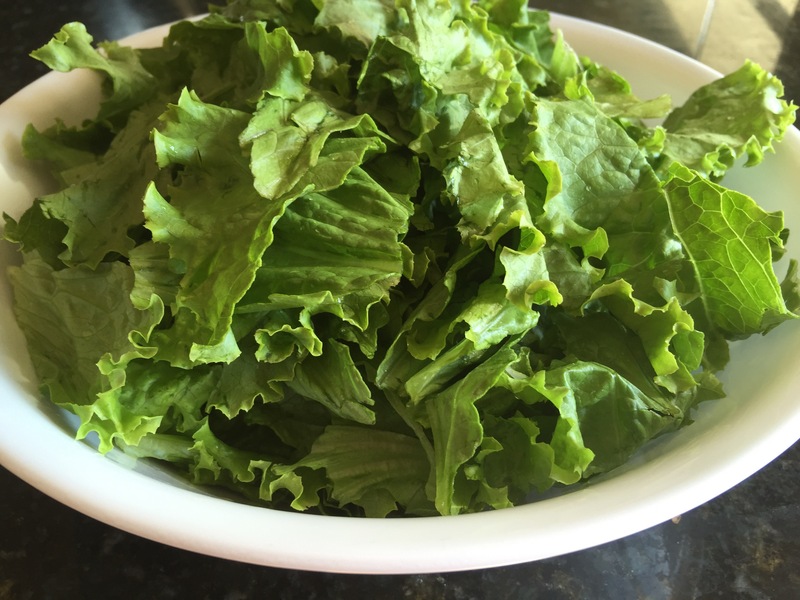 Wash each lettuce leaf, rip into bite size pieces with your hands and place into a bowl of water to soak as you prepare the other ingredients. 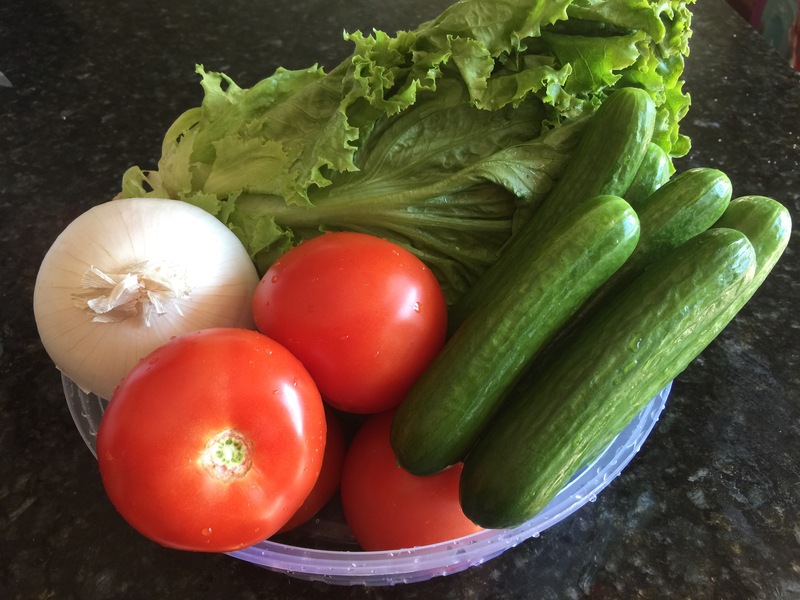 I use a salad spinner to not only clean the lettuce during the soaking stage but also dry the lettuce afterward (which is a critical step in the process of making any tasty salad). 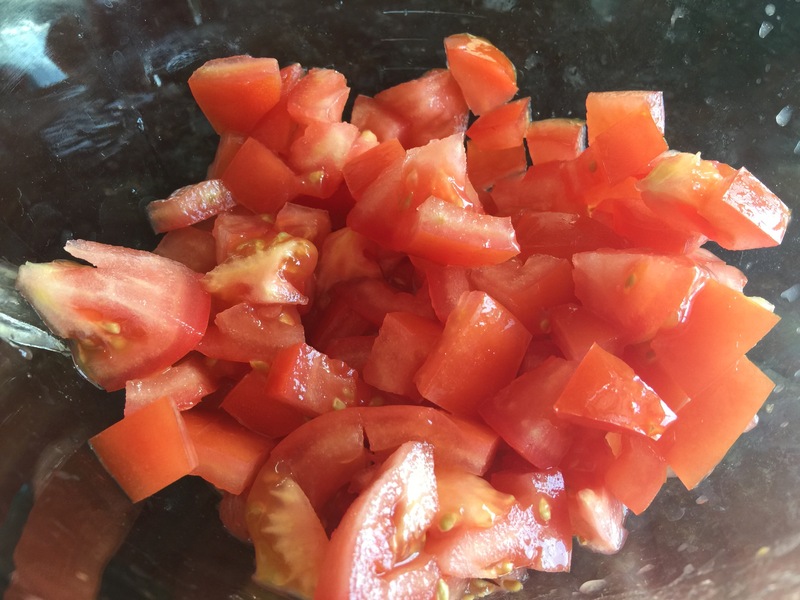 Chop the tomatoes into small chunks (about half inch squares). 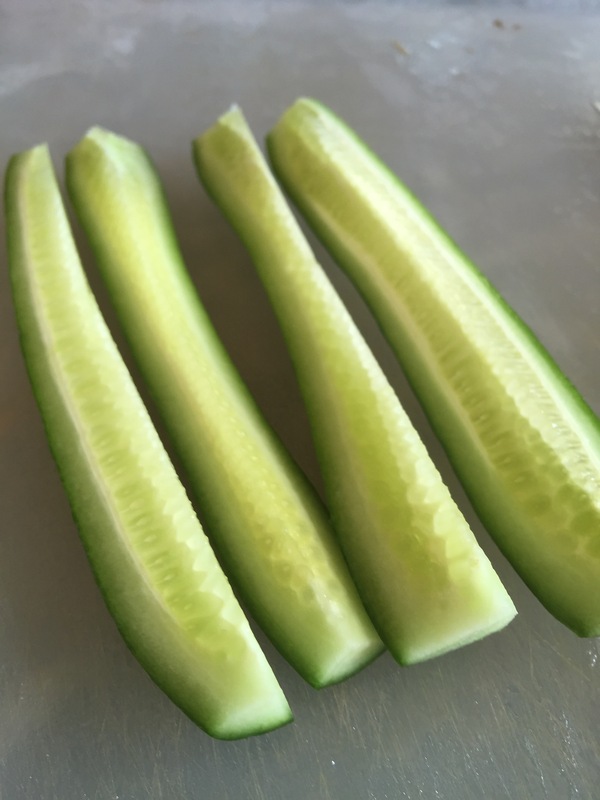 Slice each cucumber into half lengthwise and then slice each half into halves again lengthwise. 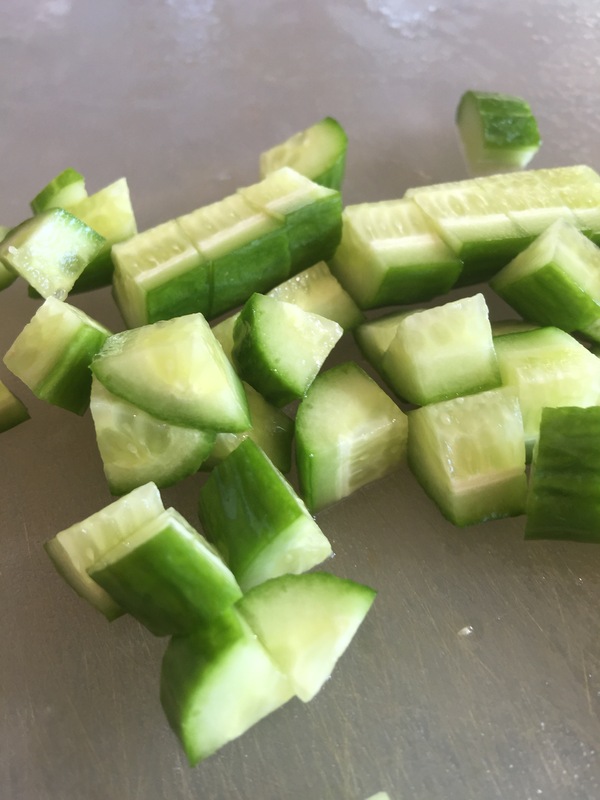 Then chop the cucumber slices into about half inch chunks. 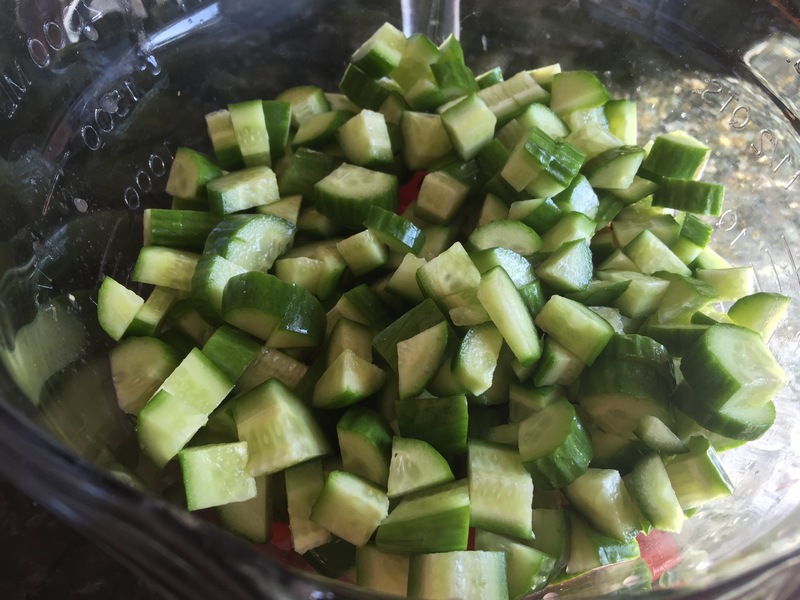 Add the chopped cucumber to the chopped tomatoes. 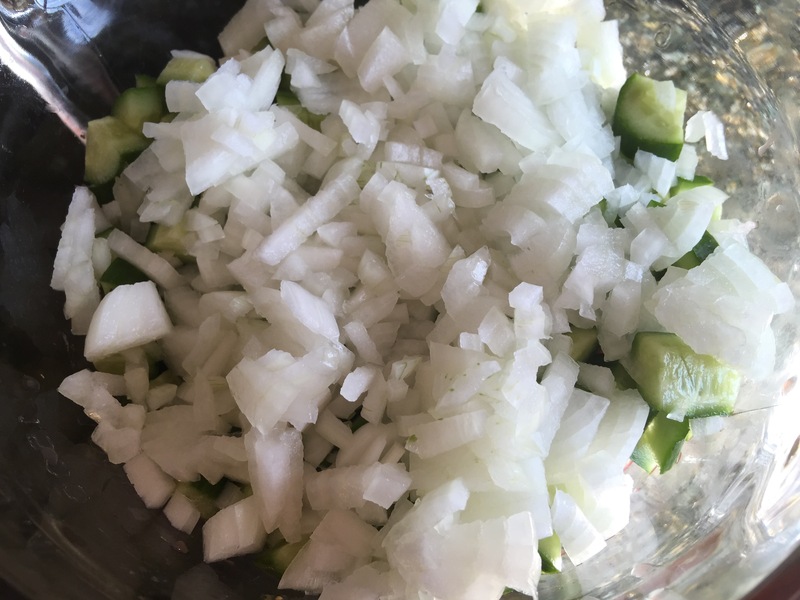 Chop the onion into small pieces (a little smaller than the tomatoes and cucumbers) and add to the mixing bowl. Peel the garlic cloves and press them using a garlic press. 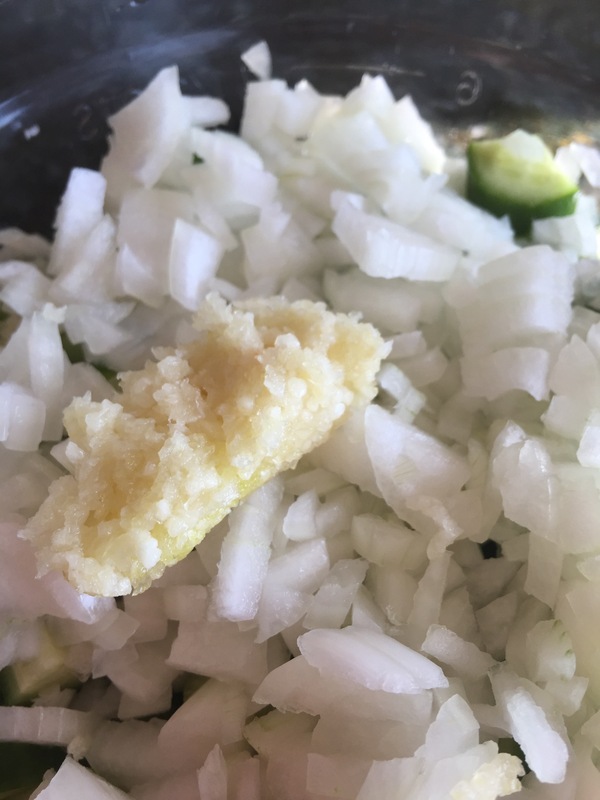 You could smash them with a knife and dice, use a zester, or use a mortar and pestle if you don’t have a garlic press, but I highly recommend getting a good garlic press since it is so much easier to use. I got my garlic press as a bridal gift about 9 years ago and it is still going strong. It is on top of my list of must-have kitchen tools. 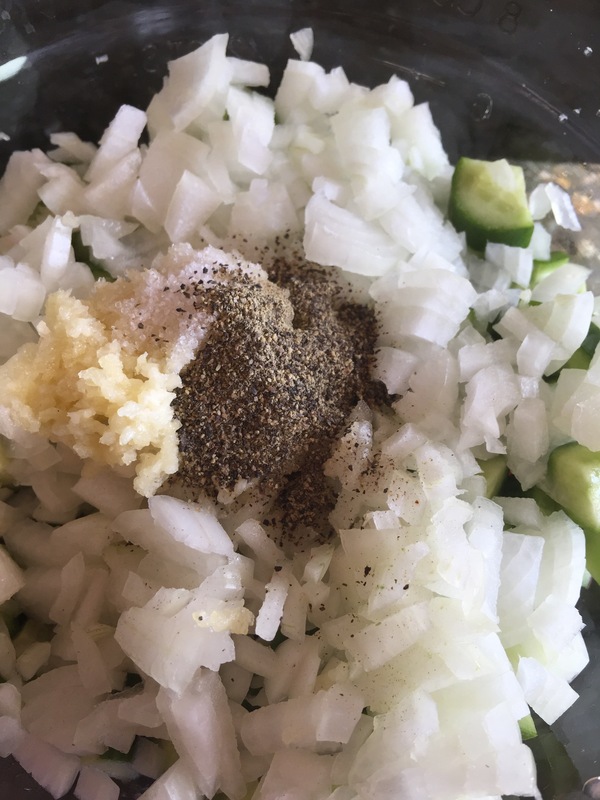 Add the salt and pepper to the mixing bowl. Add the lemon juice to the mixing bowl. Add the olive oil to the mixing bowl. 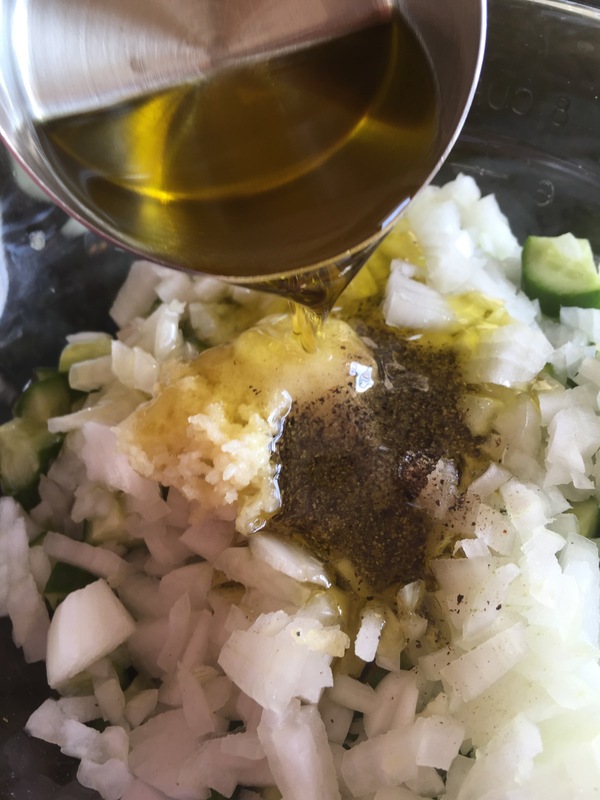 Stir it all together and taste for desired levels of salt, pepper, garlic, lemon juice and olive oil. Adjust to your personal taste. I like mine lemony, but if you prefer a less tart taste, simply add more olive oil to dial down the lemon. 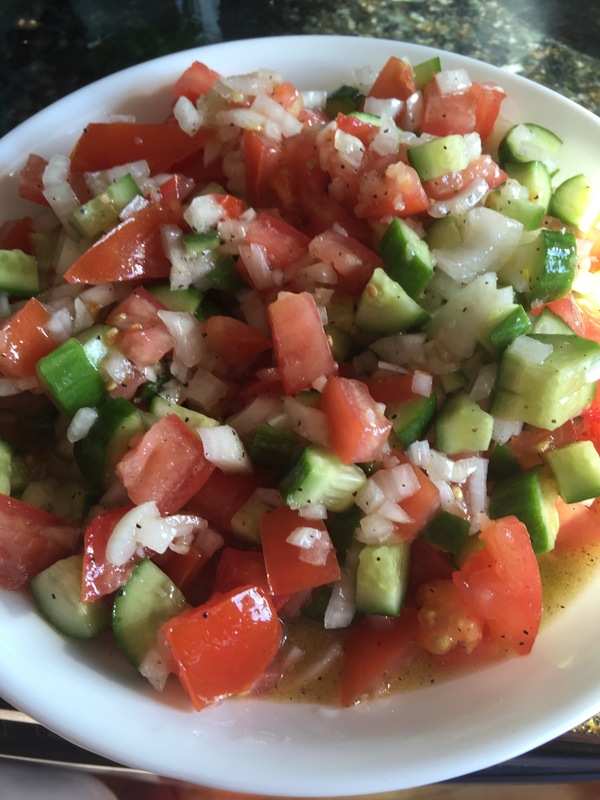 Now….you could stop here and it would be a very good Lebanese Salata that you can serve with any meal. I often eat it just like this. You can add chopped mint to this if you want, to make it more authentic. 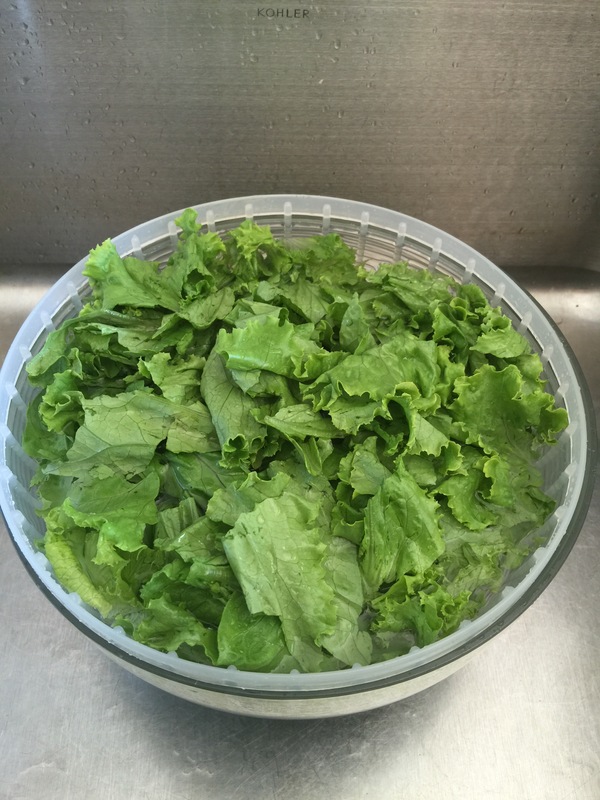 Rinse the green leaf lettuce pieces again to ensure no debri remains (remember that it grew in soil) and completely dry it using a salad spinner or placing it on towels or paper towels to dry (drying the lettuce is a very important step to avoid a watered down tasting salad). Place an individual portion of the green lettuce into a bowl for each person. Place a heaping scoop of the tomato cucumber mixture on top of the green lettuce. 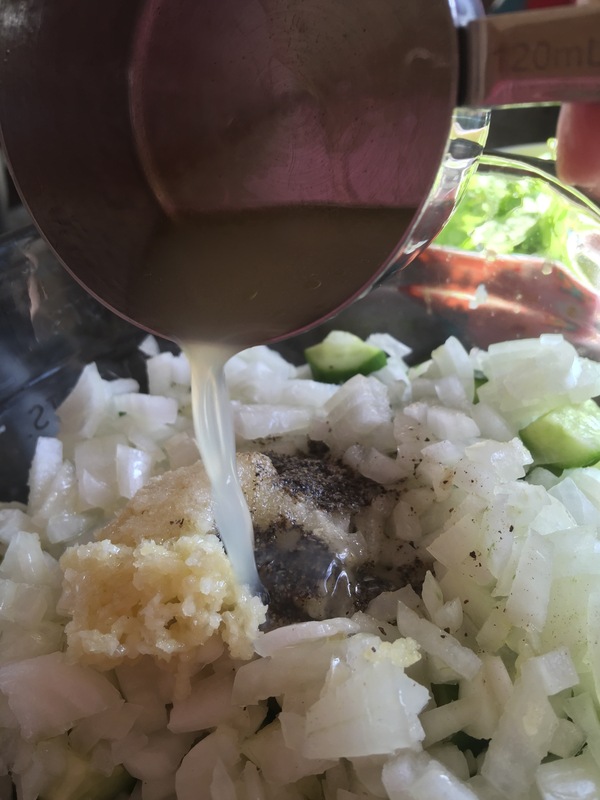 Be sure to include lots of the lemon and olive oil juices from the bottom of the tomato cucumber mixture since this serves as the dressing for the salad. Now all you have to do is sit back and enjoy this nutritious tasty salad. 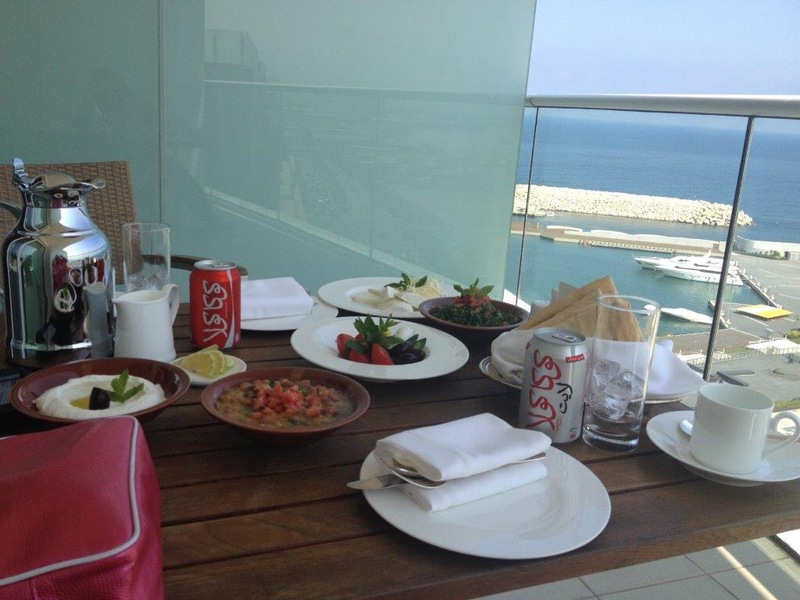 Here is a photo of that breakfast on the balcony with the radishes at the Four Seasons in Beirut…….a nice way to spend a morning! 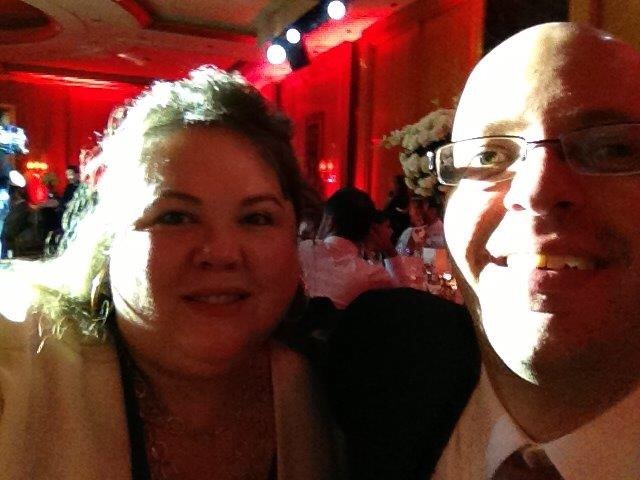 Me and my husband at a wedding at the Four Seasons the night before…. 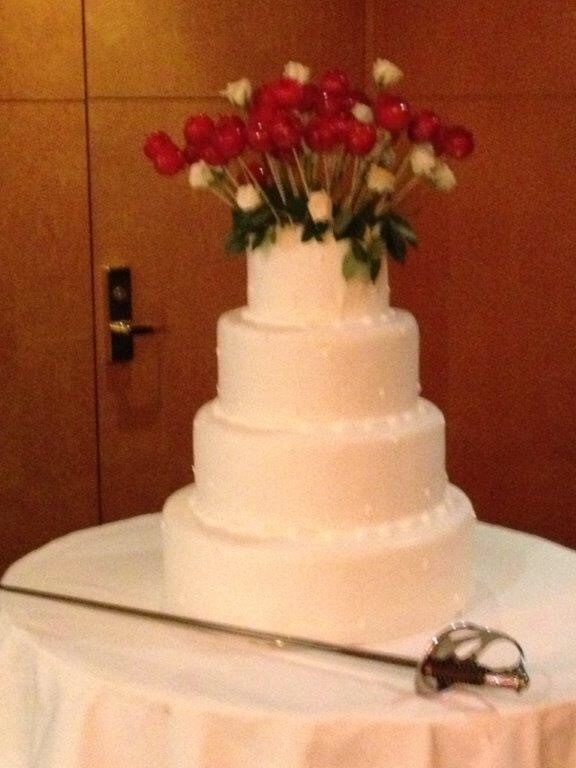 Check out what they used to cut the cake with at that wedding…. Could you use a purple onion? I could have made this salad this past summer with all the cucs and tomatoes I had from the garden. Looks refreshing.